In October 1979, a series of potentially catastrophic events was set into motion: President Park Chung-hee was assassinated, South Korean officers staged a coup d'état, and South Korean troops brutally suppressed civilian demonstrators during the controversial Kwangju uprising. Unfortunately, due to sales rights restrictions, we cannot offer Korea On The Brink for sale in your country. In October 1979, a series of potentially catastrophic events was set into motion: President Park Chung-hee was assassinated, South Korean officers staged a coup d'état, and South Korean troops brutally suppressed civilian demonstrators during the controversial Kwangju uprising. Any one of these incidents could have sparked another major conflict on the Korean Peninsula. General Wickham contends war was avoided largely because of resolute action taken by the governments of the United States and the Republic of Korea, and because of the combat readiness of U.S. and South Korean forces. Moreover, he believes that this deterrent contributed to a political-economic evolution in South Korea and to subsequent peaceful transfers of power. 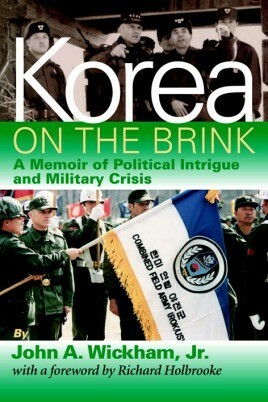 Korea on the Brink sheds light on how political-military policy is formulated within the U.S. government and on how such policy is shaped and executed "in the field” under trying circumstances.